Japan’s efforts to increase the number of international students coming to its shores are being dwarfed by similar initiatives in neighboring China. Lofty goals such as Prime Minister Shinzo Abe’s plan to attract 300,000 foreign students by 2020 appear to be struggling to gain traction. While few, if any, nations can compete with the deluge of financial investment and hordes of students China has fed into the global education system since the early 1980s, the Asian giant’s strategies and ambitious approach can offer pointers to Japan about what more it could be doing to catch up. While China now hosts 8 percent of the world’s 4.3 million international students, it accounted for less than 2 percent just a decade ago, according to the Institute Of International Education (IIE). During this time, Japan has remained fairly constant with a 3 percent market share. Globally, China has become the third most popular destination for higher education after the United States and United Kingdom, with an international student body that has been growing by 10 percent annually. Meanwhile, Japan has fallen from sixth to eighth place in the rankings, trailing France, Germany, Australia and Canada. Of course, Japan’s booming economy was once the main draw for international students coming to Japan. Now, China is benefiting from the same phenomenon. At Dartmouth College, for example, an Ivy League school in New Hampshire, while first-year enrollments to study Japanese were slightly higher than those for Chinese in the late 1990s, Chinese enrollments are now two to three times those for Japanese. So who still comes to study in Japan? The Ministry of Economy, Trade and Industry has pledged to invest $500 million over a 20-year period in its Cool Japan global PR campaign, partly with this demographic in mind. Connie Zhang, a student from Beijing studying business and commerce at Keio University in Tokyo, fits this characterization. “I was interested in Japanese culture, drama, movies, fashion, food and idols,” she says. Her family, however, wanted her to study in the U.S. because she had been studying compulsory English since primary school. Some have criticized Japan’s higher-education sector for its narrow international focus, arguing it has undergone an “Asianization” rather than internationalization. 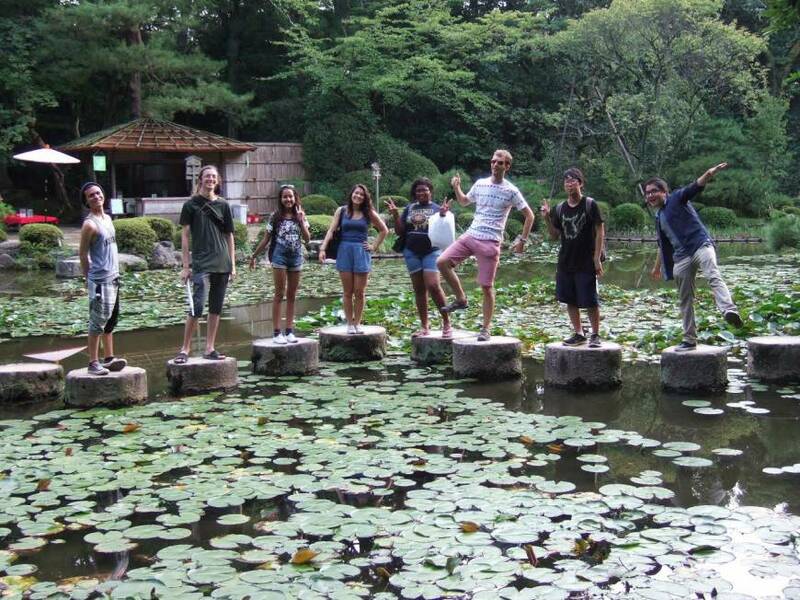 Of the 135,000 international students in Japan, 90 percent come from Asia. Chinese represent 60 percent of the total, South Koreans 11 percent, followed by Vietnam with 5 percent and Taiwan with 4 percent, according to the Japan Student Services Organization. Meanwhile, China has a more diverse international student body. According to the China Scholarship Council, of the 300,000 international students in China, 21 percent hail from South Korea, with 8 percent from the U.S., 6 percent from Japan, 5 percent each from Thailand, Vietnam and Russia, and 4 percent from India. That total is likely to top 500,000 within the next two to three years, believes IIE President Allan E. Goodman. A commonly cited obstacle to studying in Japan is the predominance of classes conducted in Japanese. Because of language similarities, this is a less intimidating hurdle for students from Northeast Asia. On the other hand, says IIE’s Blumenthal, “China’s great success in attracting international students has come from offering full degrees in English.” But, she adds, “Many students from Korea and Japan and other parts of Asia are studying in China, and studying in Chinese, to prepare themselves for careers that will be linked to China’s booming economy.” Learning the Japanese language no longer holds such promise. Another consideration is the classroom learning style. Students from within Asia “are willing to accept the Japanese style of teaching in traditional huge lectures where a professor is lecturing and reading,” says Blumenthal. “It’s different from the American style of education requiring students to challenge the professor.” And though many universities in China still teach in the traditional way, more Chinese professors are studying abroad and then incorporating more Western styles of instruction into their teaching upon their return. A decade ago, inspired by venerable cultural organizations such as the British Council, Alliance Francaise and Goethe-Institut, China began subsidizing Mandarin language and Chinese culture study through the establishment of Confucius Institutes at partner universities and Confucius Classrooms at primary and secondary schools. There are now over 1,000 such programs globally, including at top-ranked universities like Stanford in the U.S., the London School of Economics, the University of Melbourne, Lomonosov Moscow State University, and Waseda here in Japan. As a further incentive for foreign students to study in China, Chinese universities are forging partnerships with globally renowned universities. Students can enroll in the MBA programs of Tsinghua University or Fudan University and graduate with a degree from the host school and a course certificate from the MIT Sloan School of Management, for example. These programs are taught entirely in English and in the American style. Another route for international students and Chinese nationals alike is to matriculate at the branch campus of a Western university in China, such as New York University in Shanghai, the soon-to-be-opened Duke University site in Kunshan, or the University of Nottingham campus in Ningbo. Bruce Stronach, dean of Temple University Japan, the Tokyo campus of the university based in Philadelphia, recalls that there were about 40 foreign U.S. institutions with Japan campuses in the 1980s. Most closed, he says, “because of two basic factors: faulty business plans and no real sense of mission. Their business plans really depended upon continued funding from the Japanese side, and that dried up over time in the post-bubble era. They never really designed their programs to be self-sustaining with study abroad and domestic students. “The other thing is that although there was an attraction to developing programs in the leading country in Asia and the second leading economy in the world, few had any real sense of mission — and here’s the important part — a real sense of commitment on the home campus,” Stronach says. China is also investing heavily in scholarships for incoming students. According to Blumenthal of the IIE, 50,000 scholarships are available annually through the China Scholarship Council, a nonprofit institution affiliated with China’s Ministry of Education. In tandem with Beijing, the U.S. is promoting the use of these scholarships by American students. In 2009, President Barack Obama announced the 100,000 Strong China initiative to increase the number of U.S. students studying in the Asian country. The Chinese government offered an initial 10,000 Bridge Scholarships just to get the program started. Meanwhile, the already low and decreasing number of Japanese students venturing abroad for study may influence the low numbers of international students coming in, as the former act as ambassadors for Japan overseas. Between 2006 and 2010, Japan’s outgoing numbers have fallen 10 percent annually, dropping to 40,000 in 2010. Though data is not available for the years since, it is believed that the numbers have continued to fall. In contrast, China — with an overall population 10 times that of Japan — sent 340,000 students abroad in 2011, and the number is growing, a trend that is unlikely to end anytime soon considering the aspirations of the burgeoning Chinese middle class. To be sure, Japan is making greater efforts to send more of its students overseas on scholarships, through initiatives such the Ministry of Education’s Tobitate! Japan project, established last year. And Kyoko Shibata of the ministry’s Higher Education Bureau says efforts are being made to introduce joint degree programs and increase the number of courses taught in English. However, alarmed by the reduced flow of students to and from Japan, the United States-Japan Conference on Cultural and Educational Interchange convened a task force last year that came up with a comprehensive 33-page document outlining specific recommendations to be put into place to halt the rot. Whether projects like the recently announced Super Global Universities project, which will subsidize 37 universities’ efforts to internationalize, will make a difference remains to be seen. If all goes according to Abe’s plan, Japan will have 10 universities within the list of 100 top-ranked higher education institutions within a decade. Conversely, the worst-case scenario is that a lack of investment and initiative will leave Japanese universities lagging behind their up-and-coming competitors in emerging countries such as China. Regardless, Japan will be forced to shift its focus and cast its net wider because incoming student numbers from China are falling, Blumenthal says, amid a “diplomatic and strategic struggle” between the two countries over issues of territory and history. “With over 60 percent of Japan’s international students from China . . . Japan will be hard-pushed to have their total international numbers double when the largest sending country is becoming reluctant to send,” Blumenthal warns.